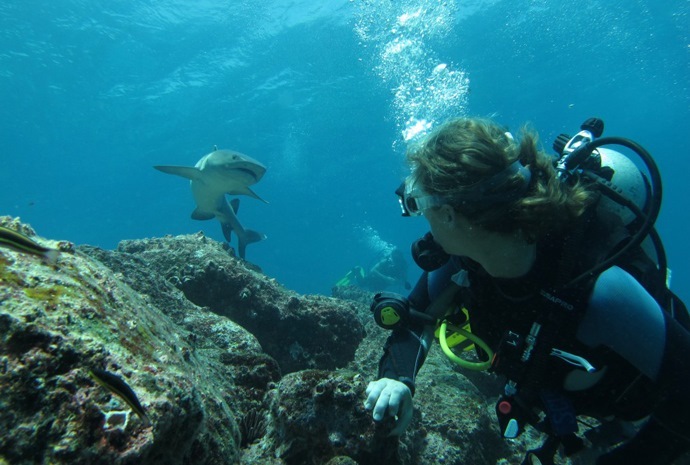 Travelling in the Galapagos is all about the unique wildlife and landscapes, and you can enjoy these even more and get closer to nature by sampling some of the activities that are available on the islands, such as scuba diving (see below), snorkelling, kayaking, surfing, cycling, walking, horse-riding, sailing and fishing. 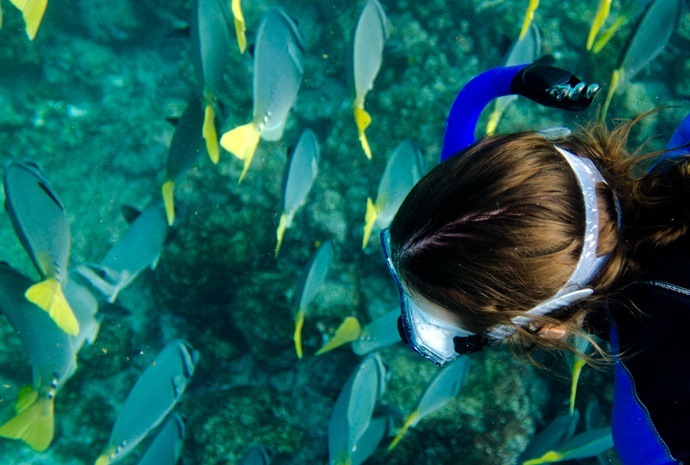 Snorkelling is one activity which can be enjoyed by visitors of all ages, even those who are not strong swimmers. There is nowhere else in the world where you can swim with sealions, turtles and marine iguanas as well as seeing lots of beautiful marine life and fish from sharks and rays to parrotfish and puffers. You can bring your own snorkel equipment, but it is also readily available for rent locally. If you are on board a cruise, equipment is normally provided. 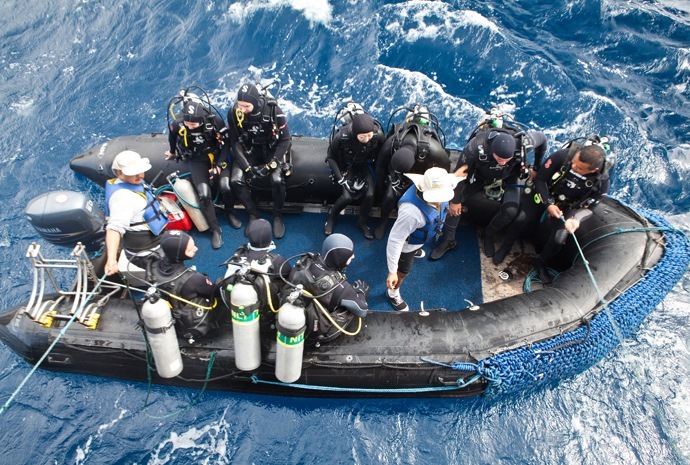 On day boat excursions, masks and flippers are provided, but not always wetsuits; however, snorkelling opportunities may only be for half an hour or so, wetsuits may not be necessary. In many parts of the islands, though, wetsuits, either full or shorties, are necessary because of the water temperature. Diving in the Galapagos is some of the most rewarding in the world with an amazing diversity of fish, reptiles, mammals and corals to be seen. See section on Marine Life for list of species which can be seen. Visitors can either take day trips from land accommodation on one of the main islands or sail on a live-aboard boat to a variety of dive locations. It must be noted that when travelling on a live-aboard boat, visitors are not permitted to land on any of the islands to view land wildlife. Kayaking is an option when cruising on many of the main vessels in the islands, but is also an activity to be enjoyed in many areas of the populated islands of Santa Cruz, San Cristobel, Isabela and Floreana. 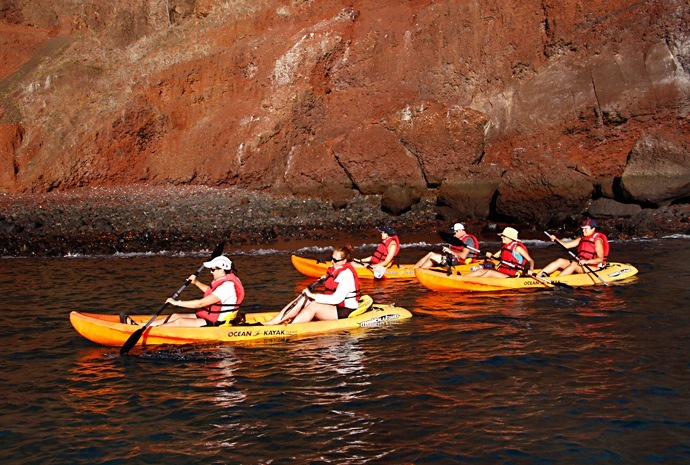 Most of the vessels cruising around the Galapagos offer kayaking as an option, usually at no additional cost. It is a great way to get close to cliff-nesting birds and see turtles and rays as they break the surface. It is also an activity to be enjoyed in many areas of the populated islands of Santa Cruz, San Cristobel, Isabela and Floreana, where you can rent a kayak and paddle from the beach. Tortuga Beach on Santa Cruz is a superb place to start with turtles, rays, marine iguanas and even sharks. This is probably the most fulfilling activity and on the populated islands there are lots of trails through beautiful countryside which reward the walker with magnificent views, encounters with wildlife, especially birds, and beautiful and often rare trees, cactus and plants. Here you can be independent: on the uninhabited islands, however, unsupervised walking is not permitted and you must always be in company of an official guide. However, in most cases you will be landing from a boat on these occasions and even with a guide, walks amongst the wildlife are always memorable. Walking - unsupervised walking is not permitted on the uninhabited islands: here you must always be in company of an official guide. However, there are lots of places and trails for walking on the main islands. Horse-riding is possible on Santa Cruz, where there are a small number of stables and riding schools and through rural tourism sites on San Cristobel. These islands offer excellent riding trails through woodland and hills with magnificent views and that feeling of freedom and of being at one with nature. The main areas for surfing are on San Cristobel at Punta Carola, La Loberia and Tongo Reef; on Santa Cruz in Tortuga Bay and off the beach at Ratonera; on Isabela from several of the wide beaches. There are lots of places where you can snorkel off a beach on any of the main islands of Santa Cruz, San Cristobel, Isabela and Floreana. . Sailing within the islands is an adventure and gives the added thrill of independence; however, to land on any of the uninhabited islands and even at many areas of the main islands, you must be accompanied by an official guide. Yachts and sailing boats can be chartered for any duration from one day upwards, but the National Park Authority has to give permission in advance for landings so, even though you can be independent, it is necessary to plan where and when you want to go and make sure that a guide is available. As one would expect, this is one of the staples of the islands; however, there is no ‘factory’ fishing allowed in the waters of the Galapagos and the locals catch on a sustainable basis, essentially for local consumption. 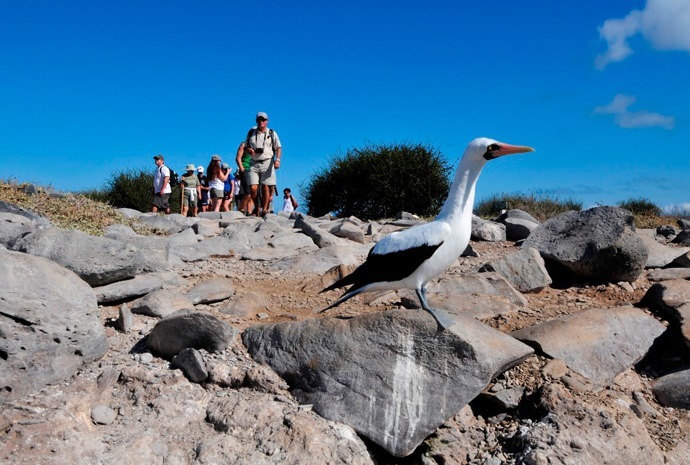 Visitors can rent fishing boats with local guides and learn and apply the traditional methods of the Galapagos fishermen. Sport fishing is also possible depending on season and is highly regulated. Various marlin are the main attraction of sportsmen, but there are also opportunities for black and yellow fin tuna, wahoo and mahi-mahi (dorado). Bicycles can be rented on Santa Cruz, San Cristobel and Isabela. On Santa Cruz, there are cycling trails all over the island. Short rides can be taken from Puerto Ayora or you can travel through the highlands right up to the Itabaca channel in the north. Bikes can also be borrowed by guests at lodges such as the Eco Safari Lodge in the highlands, where visitors ca ride to the lava tunnels and giant tortoise reserve.